You thought you knew him. You were dead wrong. Carver Young dreams of becoming a detective, despite growing up in an orphanage with only crime novels to encourage him. But when he is adopted by Detective Hawking of the world famous Pinkerton Agency, Carver is given not only the chance to find his biological father, he finds himself smack in the middle of a real life investigation: tracking down a vicious serial killer who has thrown New York City into utter panic. When the case begins to unfold, however, it's worse than he could have ever imagined, and his loyalty to Mr. Hawking and the Pinkertons comes into question. As the body count rises and the investigation becomes dire, Carver must decide where his true loyalty lies. Full of whip-smart dialogue, kid-friendly gadgets, and featuring a then New York City Police Commissioner Teddy Roosevelt, Ripper challenges everything you thought you knew about the world's most famous serial killer. 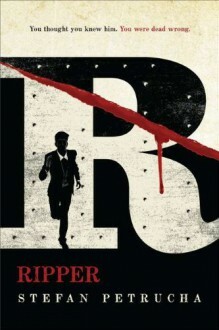 YA/mystery/hist-Fica twist on the jack the ripper story. Set in 1880,s New York City. Orphan boy taken in by the Pinkerton Agency. This is for gadget loving mystery lovers. It is fast paced and engaging. Target reader-a grade nine boy.